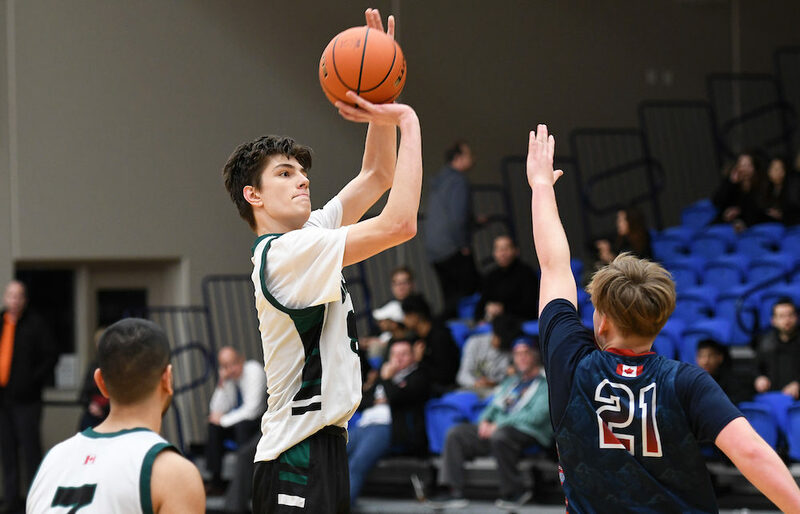 LANGLEY — By the time Vancouver’s King George Dragons take to the court in the late fall to begin their 2019-20 senior boys basketball campaign, they will be as senior-laden as they’ve ever been. And with all of that comes both a maturity and the realization that nothing ever comes easy at the B.C. championships. Seeded No. 5 and coming off its third straight Lower Mainland championship crown, the Dragons ran into a No. 12 seed that was set to reach its peak at absolutely the perfect time. Kamloops Sa-Hali Sabres not only knocked off King George 56-53 in overtime, they advanced all the way to the Final Four, eventually settling for a third-place finish. The trump card for the Dragons, who get the preseason nod as B.C.’s No. 1-ranked Double A team, is the fact that virtually its entire rotation returns in tact, including its big three, all rising seniors and all guard-based: 6-foot-8 Nikola Guzina (32.7 points, 12.2 rebounds), along with Romel Eyobe (18.5 points) and Gareth Wintjes (14.8 rebounds). Guzina, in fact, is shaping up as one of the very best players in the province next season, across all tiers. 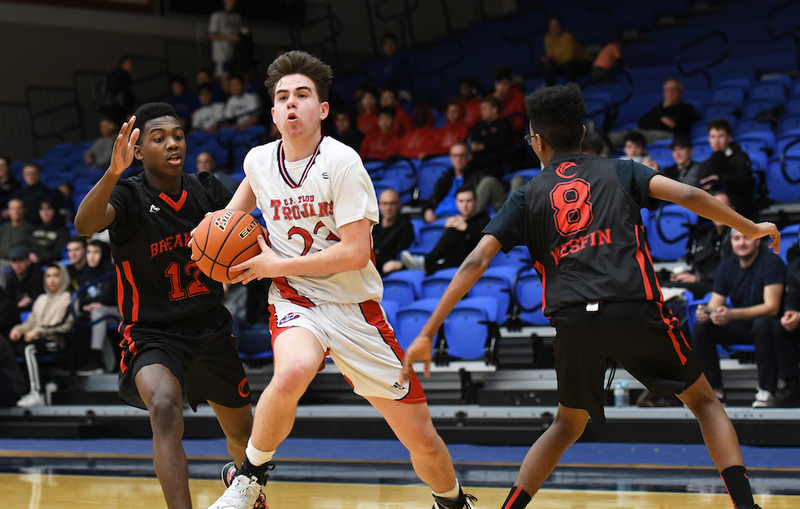 As Dragons’ longtime head coach Darko Kulic confirms, it’s the first time the senior boys team has ever attained the No. 1 ranking, be it preseason or in-season. And if they can deliver on that promise, the Dragons, who lost in the 2018 B.C. final to Brentwood College, would be advancing to a school-record fourth-straight B.C. tournament next March in search of the school’s first-ever B.C. senior varsity boys title. King George also lost in the very first B.C. tourney ever played, falling 25-21 to Vancouver College in the 1946 title game. Kulic has seen how influential its Sweet 16 loss to Sa-Hali earlier this month has already become. Sitting at No. 2 in the preseason top 10? Prince Rupert’s Charles Hays Rainmakers, the school which won it all in 2019, loses star Liam McChesney to graduation, yet seasons a roster which this past season had eight underclassmen, including rising senior guard Kai Leighton, who in Hays’ 78-51 title-game win over George Elliott, supplied 20 points, 13 rebounds, five assists and five steals. Prince George’s D.P. Todd Trojans come in at No. 3, led by rising senior scoring machine Cameron Sale. 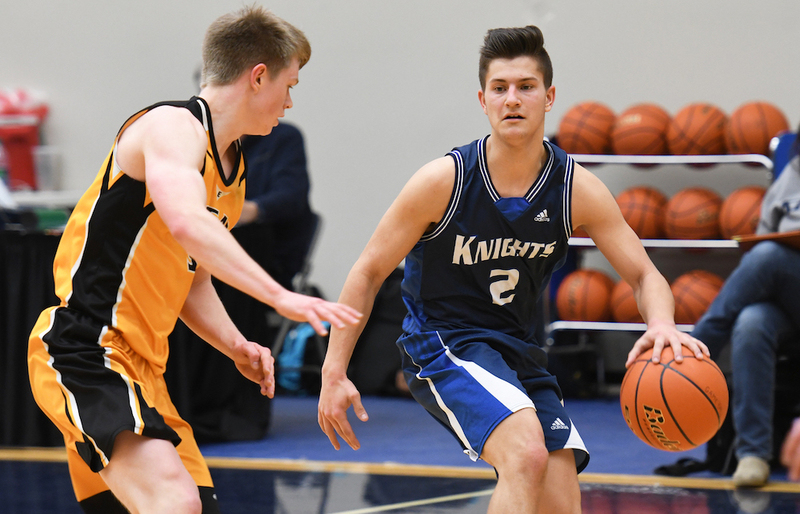 The Trojans had but two seniors on their roster this past season and still finished seventh at provincials, getting 34 points from Sale in its 68-59 placing-game win over Westsyde. Led by veteran bench boss Ed Somers, Victoria’s Lambrick Park Lions get ready to bare their teeth this coming season. The No. 4-ranked Lions are led by the rising Grade 11s Cormick Brown and Nate Crust, and rising senior Coban Scott. Brentwood College, the 2018 champs, did well to return to the dance earlier this month, following heavy graduation tolls, now 12 rising underclassmen return for the pre-season No. 5 squad from Mill Bay. North Vancouver’s St. Thomas Aquinas Fighting Saints check in at No. 6, followed by Kamloops’ No. 7 Westsyde Whundas, West Vancouver’s No 8 Collingwood Cavaliers, the No. 9 Abbotsford Christian Knights, and the No. 10 Langley Christian Lightning. NOTE — Last season’s finish indicated in parenthesis. Numeral indicates finish at B.C. Double A championships. DNP indicates finish outside of tourney’s nine placing slots. DNQ — did not qualify for B.C. tournament.